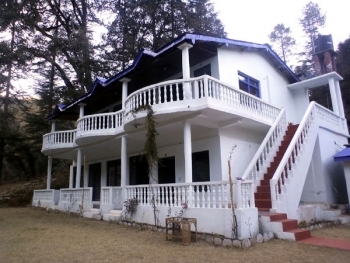 Jageshwar Jungle lodge is a deluxe accommodation set in the deodar/pine forest made it a perfect place to stay for any nature enthusiast in Jageshwar. It is away from the crowded cities, and gives you complete privacy and extreme closeness to the nature. Jageshwar Jungle Lodge is just 25 minutes walking distance from the Jageshwar temple. It is located near the dense and protected Deodar and pine forest in Jageshwar and it is very near to the origin of holy Jata Ganga River. The walk from Jageshwar temple to Jageshwar Jungle Lodge is parallel to the holy Jataganga river. There are 6 elegant rooms with attached spacious bath and other basic facilities to make your stay comfortable. The lodge uses generator and invertor for electricity supply (and there is no Internet or T.V.) but remember you are on outskirt of dense forest. Each room is having large windows & wood fireplace. The kitchen at Jageshwar Jungle Lodge produces delicious, home-style cooking from our fixed menu. Nature walks, Bird watching, Trekking, Exploring caves nearby and Meditation & Yoga. - Complimentary stay of one children below 12 years in the room. - Children above 12 Years will be charged @ Rs. 250/- with the parents in the room. - Checkout at 12.00 noon. By road: Jageshwar is well-connected to Delhi by road, and many tourists use the drive option to make their journey. The scenic route from Delhi to Jageshwar, through Corbett Park and Ramnagar is 406 km long, where as another route via Haldwani and Kathgodam is 380 km long. 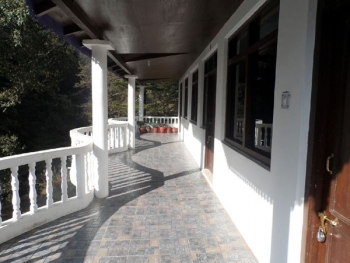 The lodge is 83 kms from Ranikhet, 54 kms from Binsar, 105 kms from Nainital, 171 kms from Corbett National Park, 355 kms from Haridwar, 37 kms from Almora, 131 kms from Haldwani. Jageshwar is well connected by good motorable roads with major northern cities of India. The distance from Delhi to Jageshwar is about 380 Kms. On reaching Jageshwar, you can drop your luggage at our office in Jageshwar & we will arrange to send your luggage in your room. We can also arrange pony-ride for you to our lodge (on prior intimation). By train: The nearest train station is at Kathgodam, located about 126 km from Jageshwar. Buses and taxis are available from the train station to reach the site.